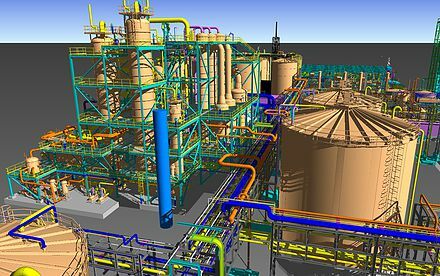 Piping engineering is a specialised branch of engineering dealing with design & layouts of piping network along with the Equipments in a process plant. 3) Giving inputs to civil, vessel, electrical / instrumentation groups for various purposes. 6. Coordination with various engineering groups & site. And ends with completion & commissioning of plant. Arranging all plant units in a logical manner to take care of Material flow, statutory requirements, & good engineering Practices. Document showing layout of all equipments satisfying the Process requirements, safety & statutory Regulations, operability ease of maintenance & economy. Document showing layouts of piping network to carry fluids From one equipment to another in a process plant satisfying The requirements as mentioned above. 3) Conceptual equipment layout drawings for process plant reflecting the process constraints. 4) Process data sheets for equipments. 5) Hazardous area classification etc..
With all this data plan the detail engineering activities. 6) Scheme for the erection of equipments in consultation with site engineer. 8) Continuation sheet numbers etc. This document shall reflect the various utilities consumed by each equipments with duty conditions like pressure, temperate, flow, state of fluid, critical data like freezing point etc. Basic material for piping items, valve specifications, special, flanges & gaskets required , any other specific requirement. This document shall mention the state of the fluid & type of equipment to be used for the storage like API Tank, silo, dehumidified atmosphere (warehouse), bullet horizontal / vertical) etc. This documents gives the type of hazard for the fluids being handled ( like class a/b/c, flammability toxicity etc.) & the special precautions to be taken care. These are to be mentioned by the client & to be taken care for the space requirement during the layout stage.